Another long driving day yesterday, but what a location we ended up at! We did 344 kms (213 miles) from Sesriem to the Gondwana Klein-Aus Vista Resort where we had camping reservations for three nights. First, we had to pack things up. We've got a pretty good ritual going where it only takes us a few minutes to get everything in it's place for driving. And everything needs to be in it's place when you're doing the whole day's drive on some pretty bumpy dirt roads! Our Namibia Car Rental 4x4 ready to go to the next campsite! Headin' on down the road. The dirt road, that is! The funny things you come across. In the distance, we could see what looked like a castle that was never finished. But as we got closer, we could see that it was actually finished and it's a resort and "spa". In the middle of nowhere. It was kind of strange! What a strange sight in the middle of the desert. And then, three minutes further down the road you come across this little shack. Didn't see too much wildlife yesterday. Quite a few springbok and oryx, and a couple of zebras in the distance. There's not very much shade for the animals. Mommy oryx with her two young ones. By the way, oryx is delicious! ...because if you don't get the correct fuel, it's nobody's fault but your own! Even though we were on a fairly major north south route, we saw very little traffic. I think that in the first two hours we may have seen four other cars! And, sometimes you have to get out and open a gate for yourself because the road runs through several private nature reserves. Remember to close the gate behind you! We arrived at the Gondwana Klein-Aus Vista resort at around 1:30pm. You'll remember that we will be staying 25 nights at the Gondwana Collection Lodges in the month of December. 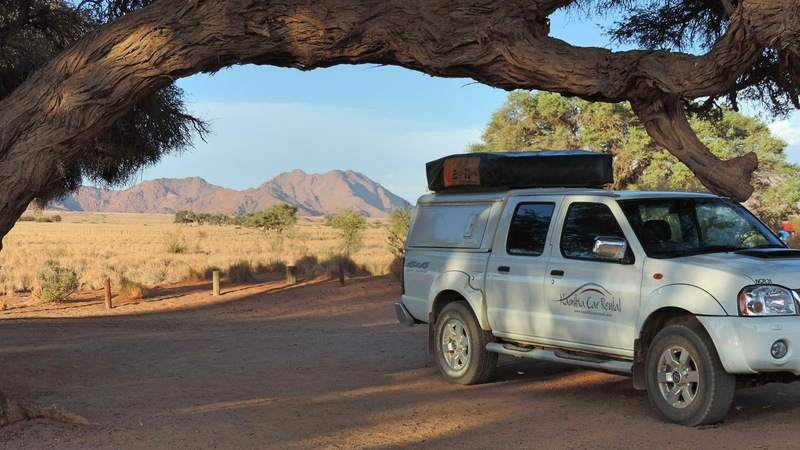 Quite a few of the lodges also have camping facilities, and coincidentally we will be camping our last three stops this month at Gondwana resorts! So we get to preview them a little before actually staying at them next month. The lodges all have internet access for their guests, and even though we are camping guests, we get to use the facilities! So we're enjoying really good internet for a change! We got caught up on things, then went and got our campsite set up and decided to take an early evening hike. Looking down on the campground. The dark structures are wind shelters. We are parked up at the far right. I think we got the best site! Kevin, showing you the fantastic scenery of Namibia! We were in bed by 9:00pm. Big hike planned for the morning, and we want to get most of it done before it gets too hot! Beautiful dusk photo. I'll bet that ride felt like a thousand miles! Looks like you have some nice privacy in that camp site. Continue to have way tooooo much fun as the Fat Old Man says. Our DIL got herself an oryx in NM and they really enjoyed it also. When she told us she got one I thought they had bought a new vacuum. Shows how much I know. Another pretty good travel day even though, not a lot to see along the way. Enjoy you awesome looking campsite! I hope you stopped at the spa to check it out. Looks like a pretty cool place! Hi Les, go back to October 3, 2012 for Iceland. By the way, you would LOVE to do a camping trip in Namibia! Is that resort / spa something like boondocking? Way out in the desert, all by it's self.